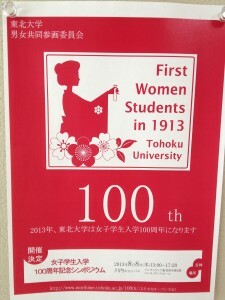 I just saw this poster in my building commemorating the fact that 100 years ago in 1913, Tohoku University was the first university in Japan to admit women as students. I didn’t know that, and I am quite pleased to be working at such a progressive place (here’s hoping they’ll be progressive enough to allow me to stay on past my initial contract LOL). 1) has women’s place in Japanese society really improved all that much in 100 years? 2) is society going to facilitate women working in the future? It always struck me as strange that there are such structural and societal limitations on women in a democracy where they make up more than half of the electorate… but I have come to realize that a lot of the obstacles working women in Japan face come from societal expectations, often voiced by other women. Japan seems to be one of the last holdouts of the housewife mother, to an extent that I haven’t seen in Europe of the US. Specifically, I am thinking about how volunteer and community groups (like PTAs, chounaikai, sports team parent groups, etc.) make no efforts to cut working mothers any slack. If anything, they seem to pick on them, at least in my limited experience. At the same time you get politicians making asinine comments like this and you wonder if things are going to change in the future? And yet women seem to have expectations of men that are becoming increasingly unrealistic, at least according to the small sample in the link. This has been mooted as one of the main contributing factors to the low birth rate -after all, if you don’t have enough money to get married, you probably aren’t going to be having children either (or at least one would hope so). What do you think? Is Japanese society supportive of women choosing what to do in life? Can you see it changing in the future? That’s a great article -thanks for the link. I know the poll is flawed, but it made a point that I have seen over and over again (first noticed it when I was teaching in a girls’ technical high school) where there seems to be a lack of understanding of the new social reality: that jobs are less plentiful and less secure, and a lot of families can’t get by on one salary any more. I love Japan but there are a plethora of times where I feel it is stuck in the 1960s. It’s a shame that openly holding such views is not an impediment to success in politics here.